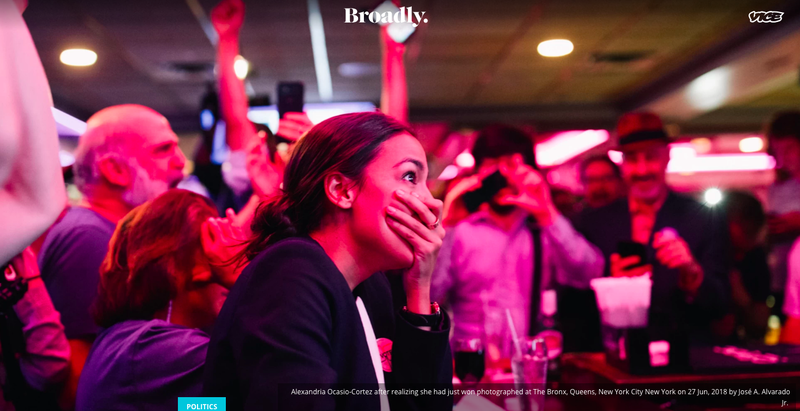 on Vice: The Story of Alexandria Ocasio-Cortez's Rise to Victory, in Photos by José A. Alvarado Jr.
For the past twelve months, I had the privilege of documenting a 28-year old Bronx woman of Puerto Rican heritage, run for office in NY-14 - a district in the Bronx/Queens. Her story has brought me to the many doors she’s knocked on, in order to register voters in her district. To the many social demonstrations and political events throughout the city she attends, all while running her campaign out of her Bronx apartment and working at a Latino restaurant part-time three days a week. After months of canvassing, Alexandria had the defied odds and garnered over 5,480 signatures to get herself onto the ballot. A goal not many felt would even be possible. Fast forward to now, and the people of NY14 have spoke, congratulations Alexandria Ocasio-Cortez the road has just started but I’m confident you’ll make your constituents proud. Thank you Alexandria for sharing your story with me and thank you Sarah Burke @elizabethrenstrom and everyone at @broadly and @vice for taking interest in the story, and sharing it with the world. By José A. Alvarado Jr. — Last month in July, I had the privilege of documenting 27-year-old first-time Latina candidate for NYS Senate Julia Salazar and her Bushwick..